St Leonards Church, Streatham , was the church attended by descendants of Ralph Thrale  during the time that they lived at Streatham Park . The Thrale family vault was under the south aisle of the church and the covering slab is still there. 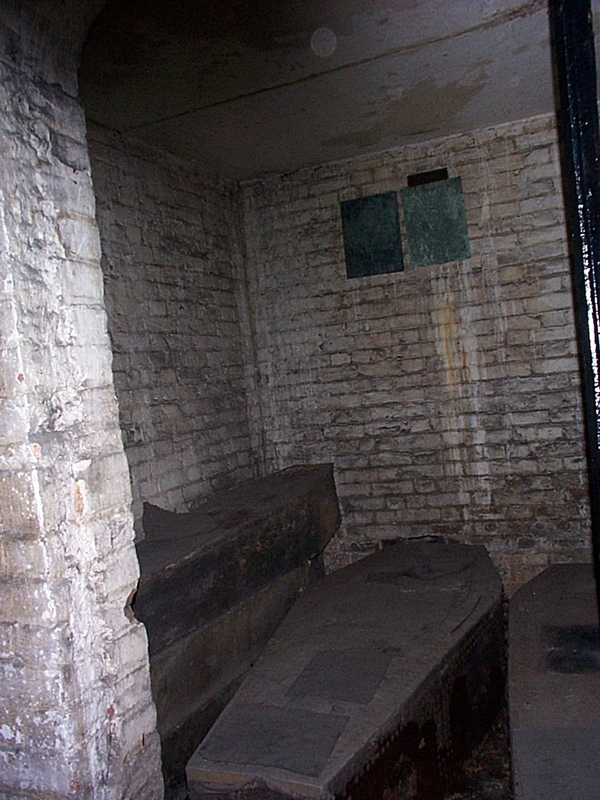 However, the family remains were removed to the new catacomb at the time of the rebuilding of the church in 1831-2. The remains are still there and were respectfully filmed by the BBC  in 2001. Ralph Thrale the elder, Mrs. Salusbury, Henry Thrale , Henry junior , Sophia , and Cecilia  were all buried in the family vault1 , besides Frances , Penelope , Anna Maria , Lucy Elizabeth , Frances Anna , and Henrietta Sophia , who all died in early childhood and who have no monuments. Susannah Thrale  is buried in the churchyard, where her nephew Thomas Arthur Bertie Mostyn, Cecilia’s son, who raised the monument to her, is also buried. 1. Bromhead, Heritage of St. Leonard's, pp. 27, 32, 35.